You can easily ignore idiots, but "Ralph" is not an idiot. Not by a long way. "Ralph" is a clever user who is skilled in the art of deception. It is noticeable how "Ralph" never actually answers a question, but constantly refers to old and discredited "peak" theories, implying that these are what people now believe, completely ( and deliberately ) ignoring the fact that we have moved on since then. It's as if I was arguing that science is rubbish because scientists once believed atoms were the smallest unit, ignoring quarks and bosons ( discovered by scientists ). If "Ralph" won't stop the smokescreens then he has to go. If "Ralph" can use his ample brain to debate the actual problems then he will be a useful contributor. It won't happen though, turkeys don't promote Christmas. "Ralph" is a clever user who is skilled in the art of deception. So now it isn't smoke and mirrors, but referencing EIA and IEA work is an art of deception? Are you serious? Is that what the major information and economic clearing houses have been reduced to, pawns of those who seek to deceive? old and discredited theories? Is that what referencing production rates coming out of the USA is now? And who discredited these theories anyway�.those same production rates and whatnot that I have been seeking to "deceive" with? It isn't called deception when it is the reality you live in Catwealze. Read back through this very site and then tell me that things, they not only didn't turn out as expected, but didn't even stop the most basic things that peak oil was supposed to stop. implying that these are what people now believe, completely ( and deliberately ) ignoring the fact that we have moved on since then. Not like TOD and LATOC and FTW and ASPO-USA you haven't. While the topic may certainly have changed, at the end even TOD recognized WHY. And those are the true believers doing the noticing�I certainly can't be blamed when the true believers themselves are the ones providing the references. and Ralph quotes TOD�.do they honestly fit into your "discredited" pile, the smoke and mirrors angle, or not answering a question from a proper peak acceptable source? Ralph, I've written before that many people believe we've seen the end of cheap oil, and that this is a problem. Do you think this is OK ? Before the period 2005-2008, the oil producers could effectively control the price. All that was required was co-operation (basically, the existence of OPEC). In 2008 they lost control, and a new factor entered the equation - demand destruction caused by the relatively much higher price. The big drop immediately following the financial crash in the 3rd quarter of 2008 was caused by the initial wave of demand destruction, and since then a new equilibrium has established itself as demand is continually "trimmed" as various parts of the world bob about on a rough sea of economic uncertainty. That's "all" peak oil eventually amounted to in terms of a change: the replacement of a human-controlled oil price with a price determined by the balance of demand destruction against forces trying to create economic growth. But that is surely enough to change the world in major ways. Call me silly, but when one of the worlds most important natural resources quickly becomes several times as expensive I get a bit worried. Of course not. The real "cheap oil" ended back in the early 70's. This one is good. 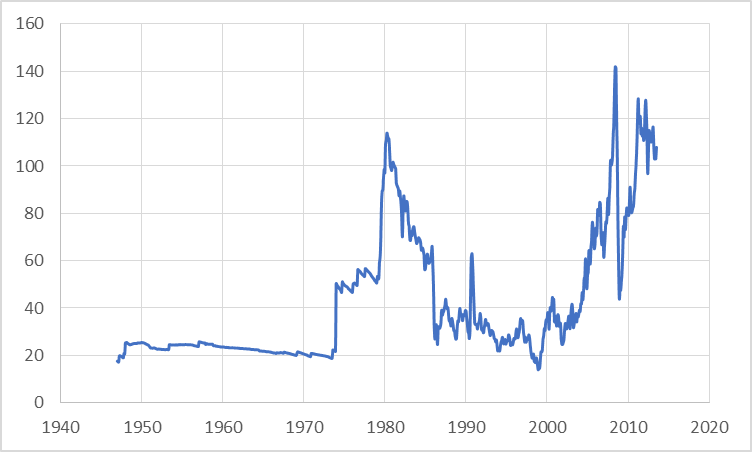 You can see where the 70's running out fears began, and only an economic crisis could even bring it back to close to the price it once was. It has been trending upwards ever since. Part of the rinse and repeat cycle of resource scarcity. More then a little ironic though, right? Right about in that dip in the late 90's is when Campbell and Lahherrere did the "End of Cheap Oil!" thing�.and they could have seen that huge spike into NOT cheap if they had chosen to look, and come up with a better title. Like�"Cheap Oil Ended a Quarter Century Ago�but just wait to see how much people scream when we do it again!" Absolutely. Peak oil changing the world for the better, one new car sale at a time. No, Ralph. A rise in sales of electric cars is not going to be enough of a re-adjustment to the end of cheap oil. The demand destruction is not just for petrol purchased by people who are able to afford and use an electric car. It puts a permanent limit on the future possibilities for global economic growth. It means we've entered a new era of economics where global growth becomes impossible in anything but the shortest timescales, which in itself must eventually lead to a new sort of non-growth-based economics, if it doesn't lead to a full-scale collapse first. No, Ralph. A rise in sales of electric cars is not going to be enough of a re-adjustment to the end of cheap oil. Not alone. But obviously peak oil isn't working out as some hoped, and it is reasonable to ask WHY. The assembly line manufacturer of post peak oil transport is just one of those WHYS. Certainly those ever growing number of EV users are using less liquid fuels than they once did, and economic theory is perfectly happy with categorizing this as either conservation or substitution, your choice. The demand destruction is not just for petrol purchased by people who are able to afford and use an electric car. It puts a permanent limit on the future possibilities for global economic growth. Your point is like saying that if we jump high enough, the atmosphere gets thin and we suffocate. Sure. But that isn't the issue. The inability of our legs to let us jump 30,000' high places a limit on our jumping, not the lack of oxygen in the higher portions of the atmosphere. It means we've entered a new era of economics where global growth becomes impossible in anything but the shortest timescales, which in itself must eventually lead to a new sort of non-growth-based economics, if it doesn't lead to a full-scale collapse first. There is no "new era of economics", general economic rules and theory applies to higher priced commodities, just as it has during the most recent peak oil in 2005, or like it did when Ehrlich made similar claims based on resource prices and scarcity. Global growth has been plowing along, right on through peak oil nearly a decade ago now (versus those silly folks still claiming it is in the future ) and just because normal business cycles wax and wane, these cannot be confused with a new "era" of anything. Don't like the cost of the fuel you use on vacation? To commute? How it filters through the prices of consumer goods? React, just like others will, and when you do it will be in a completely predictable and expected economic way. Just as Greer does the "collapse early and avoid the rush" angle, I am a big fan of "react early and be in the forefront of environmental stewardship!". Drive less. Sell the car. Walk more. Sell the car and get a more efficient one. Turn off your lights. Insulate your house. Get your neighbors to turn off their lights. My windmill electricity stands at 13.8%, how is yours? My PV electricity is near 20%, how is yours? How about your neighbors? Certainly jevons paradox doesn't apply so well to solar flux when it comes to some using less encouraging everyone else to use more, PLEASE USE MORE. And some choose to use it in such a way that they can still drive around and not worry about the price of liquid fuels as it pertains to the area it is utilized in the most�transportation. They hand out fuel for free at the local department stores now, and other government buildings as well. Change early! Avoid the rush! We are consulting now but input from some of the original members can take time. If the original members take so little interest in the health of the forum, why wait?